I know for a fact that I so love myself, like a Samantha Jones love of myself. And one way how I show to myself how I love me, (don't worry this blog is not all about me! LOL) is by buying some wonderful things like clothes, bags, accessories, and most specially SHOES! And one great way how I practice this "human rights" that I call, by shopping during weekend sale! Wee! Last Friday, though, I'm not really one of those who gone wild and went to SM City Sta. Mesa 3-Day Sale that early, I was still one of the many people who spent some time checking out the wonderful items that on sale on this one-of-the-oldest SM Supermalls in the land. And since it falls on payday and I'm on a vacation leave from work, I know that I have enough money and time to spent around the place to buy something nice for myself. It is just so amazing that when SM declares sale, it is really a war of items on a bargain price, starting from the clothing line, apparels, home appliances and even to furniture and dining! Yes, even on food items in their Foodcourt, food are on sale or if not comes with a freebie! Really, amazing! And , yes, that's what I saw last Friday afternoon when I went there. But on the contrary, I wasn't able to really practice the "human rights" that I was saying, but rather I practice my indulgence by purchasing some nice and sweet and cuddle baby items for my beautiful 1-month old niece, Elaisha Monique. Tell, if you have a nice as pretty as her, wouldn't you be delighted to shop something for her? Well, I just didn't shop "some thing" for her, but instead I actually shopped a lot for her, making me spent my shopping budget for myself! Hahaha! Now, tell me this time, am I not a good and pretty uncle? Hahaha! And those are just some of what I've got for her. I also saw some more baby stuff, so I might go back this Sunday, before SM City Sta. Mesa ends their 3-day sale. Hehe. I'm planning to buy her a crib even though she's still can't move that much and maybe some more clothes. Because the way she's growing and progressing, in no time, I know we'll be needing something nice and durable for her. She may look sweet, but I can feel that she's gonna be one tough kid, and I so love her! And since, this Sunday is her 1st month, we're planning to do some dress-up game first, before heading back to SM City Sta. Mesa. And I'm so excited to fit these clothes on to her! Hahaha! SM City Sta. 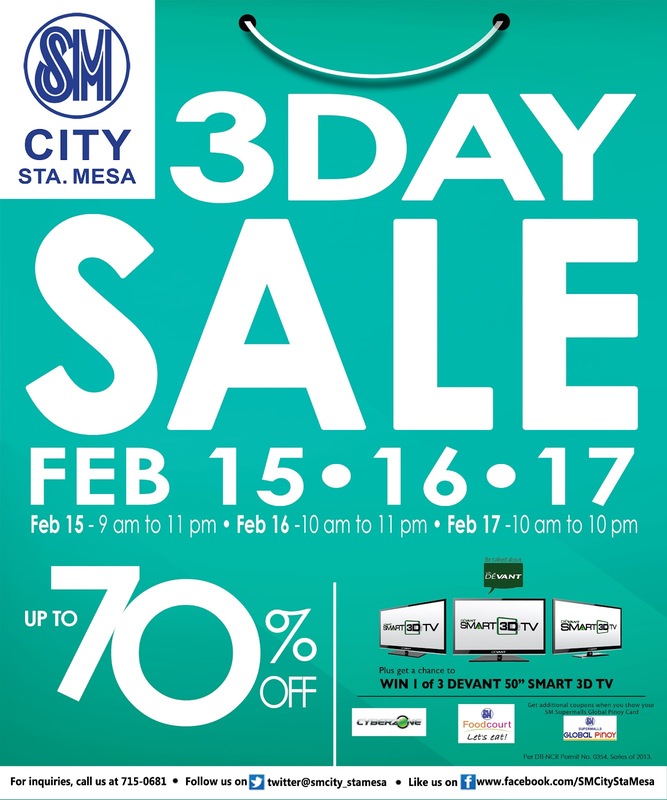 Mesa is happening on February 15, 16 and 17, and you can actually avail discounts for as much as 70%! There are also other promos, contests and freebies that you can avail, and for that info, just check this previous post of mine. Thank you, SM City Sta. Mesa! You really got it all, and I can't help but to get excited on shopping there again tomorrow! See you, guys, there!!! Happy shopping!